Howdy folks!! Welcome to this week's edition of Linky Love! As always, you all never cease to amaze me with all of your Frugal Decor ideas. 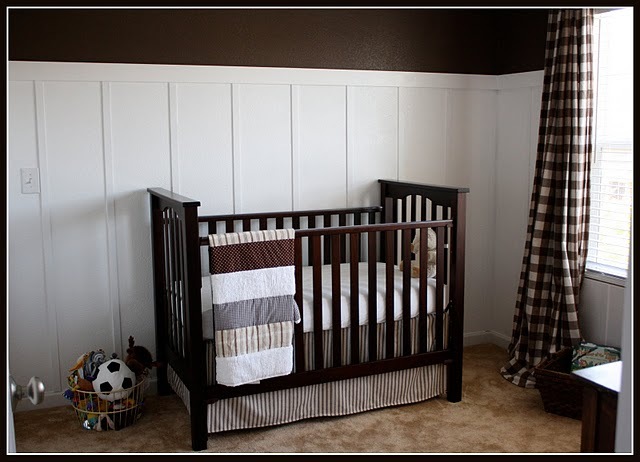 Emily from Imperfect shared a brown-and-white-board-and-batten nursery. Love. it. Becky at Tea Party shared an amazing DIY ottoman. Although she admits this was not an "easy" project, I think you'll agree that the result was impressive! After talking about the Dignitet display system from IKEA yesterday, I thought that the clothespin art display Robin at Keep Home Simple shared was quite timely. Finally, Jami from The Blackberry Vine shared a darling photo project...framed photo confetti. I'm always game for a new way to display photos, and this one is quite clever. Great ideas! That ottoman is fantastic! Oh, thank you for sharing our nursery! What a fun Tuesday morning surprise. I am loving that ottoman!!! Thanks for featuring my Framed Photo Confetti! You made my day! I just notice my ottoman on your linky love! Thanks for the love, it made my day! Thank you for featuring my clothes pinned art. I looooooove your blog!